Leezy Lindsey: We're not lazy. We're just good at relaxing. We're not lazy. We're just good at relaxing. Our porch light hasn't worked since we moved in (over a year ago) because we haven't gotten it fixed. We can go a few days (maybe weeks) before replacing a light bulb that is no longer working. Sadie broke her crib about 6 months ago and I just replaced the towel and ribbon that was holding it together with wood glue and tape last week. Our power bill is way higher than it should be due to the ducts needing a desperate cleaning. 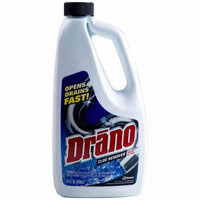 So, it would come as no surprise that it has taken me over a year to buy some Drano to fix the clogged sink in our bathroom. I finally remembered while I was at Walmart last week and I'm happy to say that brushing my teeth no longer consists of racing against the overflowing water. Haha! I hear ya girl! We Snows are a lot like you Snows! That is so the way it goes isn't it? There will always be something to fix or clean. It just never ends! Lindsey, Happy belated birthday to you too!!!! It was great seeing you guys last night. We should hang out more often, watch the BYU games together or something (I'll just entertain Sadie)!!! :) I'm glad she likes me because I think she is SOOO adorable!!!! I would love to do baby announcements for you whenever the new addition comes out!!! Let me know if you have any ideas, we'll through something together!! !